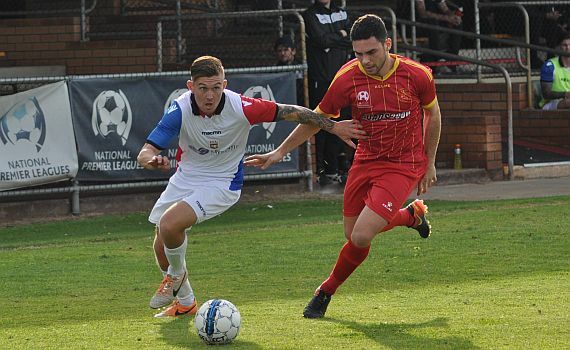 The Jacks have come home from Macedonia Park with a 2-2 draw against Stirling Lions in Week 16 of the PS4 NPLWA, but they could have won all three points, but the Lions produced a good second half comeback to earn themselves a point. It was a classical ‘game of two halves’. The Jacks dominated the opening 45 minutes, and led 2-0 at the break, with goals to Jack Iredale and Daryl Nicol, but the Lions hit back with former ECU midfielder Lukas De Lima and Cameron Teece on target, and they had chances to win it, but both sides had to settle for a point. McCulloch was forced into one change to the side that beat Armadale last week, with Gordon Smith out suspended, and Ross Millard returned to play out wide in midfield, with James Owen going up top. It was nearly two, six minutes later, Sam Pollard sent Nicol through, he held off his marker, but his shot crashed off the post and away to safety. But the Lions lifted and went close themselves moments later, Teece was sent in on goal, but the striker fired wide of the target. The Jacks looked dangerous every time they went forward, with James Owen, Millard and Nicol causing all sorts of problems, and it was only a matter of time before they increased their lead, and it came on 24 minutes. Millard raced down the left and whipped in a deep cross from the bye-line, Owen’s header was well saved by Perkins, but Nicol was quickest to react to the rebound firing home from close-range. The Lions ended the half well and Daniel Micevski shot crashed off the post, and the rebound fell to Teece, with the goal at his mercy, but he fired straight at Fraser Greenwood, and moments later Micevski sent De Lima in on goal, Greenwood stood tall and the youngster fired wide of the target. ECU went close to a third five minutes into the second half, Shane Pickering played in Owen, whose shot was well saved by Perkins, who was keeping his side in the game. That save became more important sixty seconds later, when the Lions pulled on back. Moses Kalau sending De Lima in on goal and he finished clinically past Greenwood. The visitors should have regained their two-goal advantage again two minutes later, great work on the right by Nicol, his cross finding the unmarked Millard, but he headed over from close-range. It was end-to-end football and Perkins had to be alert again to deny Nicol, before Miki Vujacic’s curling shot was well saved by Greenwood. But just after the hour the home side levelled. De Lima found Teece on the edge of the penalty area, and the young striker fired home. The game continued to ebb and flow, Kevin Moon’s shot was well saved by Perkins, before Micevski’s cross was headed inches past the far post by Teece. Then Vujacic’s in-swinging corner was cleared off the line by Pickering. There was a still a twist late, the Jacks were adamant they had a penalty in the final minute. Keylun Pollard sending Nicol clear, he fell under a tackle in the box, but referee Matthew Southern, who was well placed, waved away their protests, and at the final whistle the points were shared in an entertaining game.